Wow. I woke up today in Haiti. Well, I wouldn’t go as far as to say I fully woke up. We had practice at 6am and you can never be too safe in those situations. I had an alarm set at 5, 5:05,5:15, 5:17….well, you get the picture. No matter how many two-a-days I did in college and post college and with Alena the Sunday before I came here, I can never really fully prepare for them. Neither can my body. But there I was. At 5am. With a choice. Go back to sleep and pretend Americans can’t tell time, or go and do what I trained everyday to do, play with my girls. Needless to say, it was a no brainer. It’s now night time. I’m exhausted. I can sit here and say, I’m still blessed. I’m blessed because I am such a goof and so bad at speaking Creole, that I made some of the girls laugh (at me, but laugh none the less) today. It makes me remember my conversation with the coach who brought me here two years ago. It was May 2010. I was a senior in college. A dear friend and I just wanted to know what we could do to give what we could to a country and a team who had just lost so much. He said we can give ourselves. Come and bring our ability to make people laugh and joke and have fun. If you know anything about me or this friend, you would know that was the perfect task for us. We are goof balls. Yesterday, even though I didn’t realize it at the time when making plans, I happened to fly into Haiti on the two year anniversary of the earthquake. What a day to come here and restart a mission I’m so passionate about. Loving my team and making sure they laugh and smile and enjoy playing each and everyday. I can’t wait to wake up tomorrow do it all over again. Canada ain’t ready for we have for them on game day! Today was quite the day. I woke up, well before my alarm. It was time. Time to face my amazing day to be. Nervous? Oh yeah. Excited to get this party started? You bet. Got to the airport pretty early, then obstacle number twenty something of my planning for Haiti happened. I went to check in, and they said they had a right to refuse me because I did not have a return flight out of Haiti, only a one way. My heart dropped. I realized in that moment how much this trip meant to me. How much reuniting with my teammates and coming to meet them in Haiti was to me. For a split second, I panicked. Luckily, my older sister had a grip on things and handled it for me. Thank God for big sisters. On to the plane I went. And into my own row to try and get some shut eye. But all around me I heard people speaking in Creole. The nerves came back. Would I remember any Creole? Will the new coach speak English? Oh man, how is this going to work if he doesn’t? Then it hit me, a calmness. Soccer. That’s what I’ll speak. I know it fluently. So do they. If that doesn’t work, I’ll speak in smiles. That too is universal. When I arrived, I saw a woman who took care of the team with my first venture with then who named me her sister before I left. I was so happy to see her. After that, we went straight to training. Ninety degree weather never felt so good after being in the winters of the Midwest and New York. My teammates greeted us with open arms. I am so happy again to have ignored fear and stepped into a place where I am open to any and all possibilities here. I’m already so happy I came. Can’t wait to train bright and early and continue our road to the Olympics!! I’m being lent out by SOUL and my mother once again for another adventure. As it says in my bio, I play for the Haiti Women’s National team. I started playing with them in May of 2010. Since then, I’ve learned so many life changing things from my teammates. I’ll start with the obvious: I’m blessed. I’m blessed to live in a place where there’s a Starbucks on every corner at a stop light, where I was given an opportunity to go to college, and where I have food and clean water at my disposal every single day. I don’t wake up thinking about how I will get clean water or if I can afford it, it’s simply in my faucet. I’m not worried if my electricity will go out at any moment, I simply flip on the switch and assume it will work. I’m blessed. 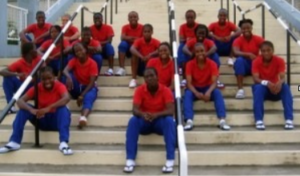 I have been lucky enough to get a chance to go to Haiti to train with my team. Since I joined, this is the first time that they held their training camp at home in Haiti. It has been a crazy past week preparing to go. I get to see my team, how they live on a day to day basis. Here’s the best part. We are training for the Olympic Qualifiers in Vancouver, Canada in a couple days. If we win enough games, we will be going to the 2012 Olympics in London this summer. I should’ve been ecstatic from the beginning when I was asked to come to Haiti, but somehow I let worry overtake me. If you’ve read the blog about my first professional team in the States, you would remember me saying that overcoming my fears in the past has gotten me where I am today. The things that have nearly paralyzed me with fear have turned out to be the best moments of my life when I fought that fear. So why should this be any different? I had no choice but to pack a bag and follow that fear right into another life changing experience….then leave that fear on the plane and have an amazing time with my team. Am I still a bit nervous? Yes. Will I let that keep me from leaving to train with my team, head to Canada and get into the Olympics?? Never. So, here’s to another adventure where I know it’s going to rock because everything worth doing can make us a little nervous at first. The best part is, if you ignore that fear and take a leap, it’s always worth it in the end. 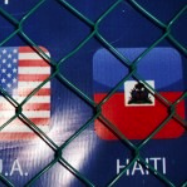 Two years ago, Haiti was hit by an earthquake that devastated the country. Since then, many people and organizations have poured relief into the country, doing their part to help. SULA’s own, Samantha Brand, was one of these people searching for a way to do just that. She and a friend wrote the coach of the national soccer team, asking if there was anything they could do to help out. Thinking their efforts would come in the form of donated shoes or soccer balls, they were surprised when the coach asked them to come and try out for the team, as the value of their support and laughter would help more than anything material…. 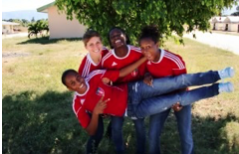 Exactly two years since the earthquake, Sam was reunited with her Haitian teammates for training camp in Haiti. They have been preparing for the Olympic qualifiers which will be held in Vancouver at the end of the month (January 19-29). The top two teams will represent their countries in London this summer. Follow Sam as she gives us a peek into the humble journey of a team, who, just like their country, is finding strength and joy against tremendous adversity.